My DDL brought me some Roy Rogers fabric & a BQ3 pattern to make a quilt for her mom. The thing I need help with is, the pattern is for 18" and 9" blocks.I would like to know which size is nicer looking. I have always admired that pattern, but don't remember seeing it made up.I would really appreciate some pros & cons for this, so I can decide. 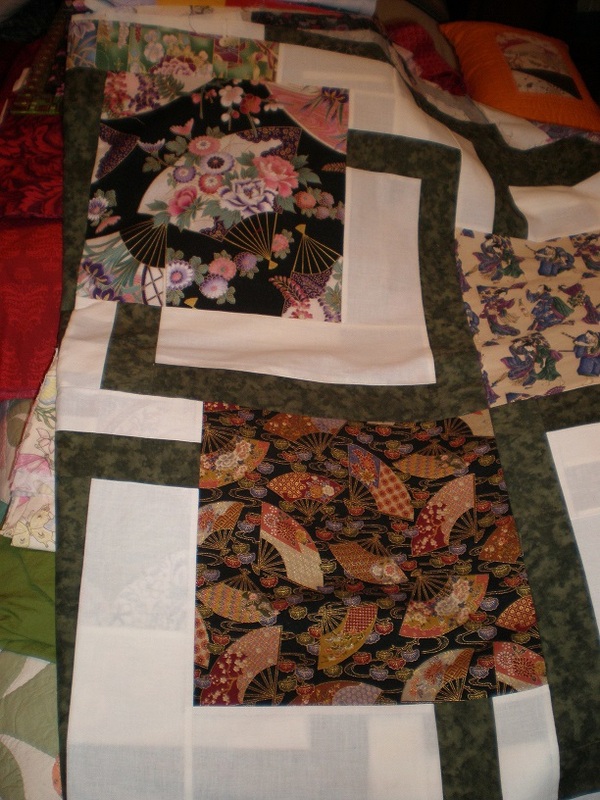 The pattern site, Maple Island Quilts, has many there in a customer picture gallery. Maybe you could go and look to see the difference and which you like better. I don't know if this pic will help but it's a king size top I have in sections. I did the larger focus cuts in oriental prints. I did the 18 inch. gorgeous! with this quilt it is all about the fabric. the 18" blocks are used for all the quilts larger than crib or baby size. Only the two smallest quilts use the 9" blocks. Thankyou for all the info. Will think about this some more. yes, my focus fabric was cut 12 inches square and the strips on the sides made it an 18 inch block. I have done both BQ and BQ2 and I changed the sizes of both of them. Even have made the blocks small enough for a table runner. You just need to keep the proportions the same. If you don't have access to a quilt program, just draft out the block in full size, then take it to a copy place and shirk it down to various sizes. See what is a simple and make a test block. GOOD LUCK !!! I have seen both block sizes in the same quilt....interesting layouts!